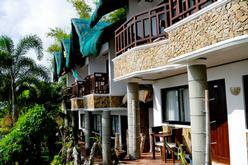 Crystal Blue Resort invites you to experience their warm Filipino hospitality set on the stunning backdrop of the bay area known as Anilao, Philippines. Crystal Blue Resort is the ideal getaway for your next adventure - where nothing has been spared to bring you the finest in accommodations, facilities, dining, relaxation, and fun! 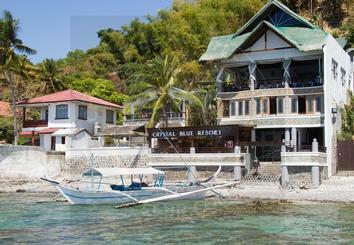 The resort fronts Balayan Bay offering stunning views of the crystal blue waters that the resort is named after. Sunsets in the Philippines are legendary and viewed nightly from their open dining room. Anilao is known as The Mecca of Macro Fauna offering all of the high impact critters that macro photographers flock to see. The Crystal Blue Resort offers an expansive, state of the art camera room, professional staff of guides, Dive Masters and Support crews will assist you on each outing and the resort staff will welcome you home. Crystal Blue offers three different room styles. The balcony/lobby offers spectacular views of the property, ocean and sunsets. 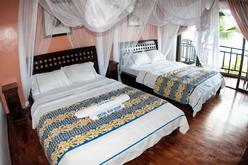 Crystal Blue has two types of Deluxe Rooms. Like the Superior Rooms, each of the Deluxe rooms has a balcony/lobby that offers spectacular views of the property, blue ocean, and wonderful sunset. Crystal Blue's open air dining room and cantina overlook the Crystal Blue Waters of Balayan Bay and feature stunning sunset views daily. Their kitchen opens each morning at 6:30 am with brewed coffee, fresh fruit, and smiling faces. Buffet or a la carte options are always available and Chef Ray is always creating something delicious. Vegetarian and vegan options are also available any time. Dietary restrictions can also be worked around on an individual basis. Room Service is available during the resort's normal kitchen hours from 7:00 am-9:00pm each day. Coffee, tea and free-flowing water from fresh water filling stations are always available in the dining room. Hot water kettles are available in the office. Crystal Blue's chef's specialties are seafood, continental, oriental and Filipino cuisine, prepared in a professional grade kitchen. The food is served buffet-style, and includes two to three choices for every lunch and dinner. The restaurant is open from 6:30 a.m. until 9:30 p.m. Coffee is served starting at 6:30 a.m.
Providing quality without formality, guests enjoy open-air dining at Crystal Blue's restaurant. 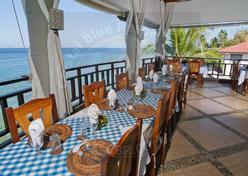 Feast on their delightful delicacies in the cozy ambiance and ocean side atmosphere. 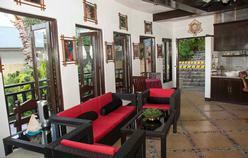 Their restaurant offers sumptuous food that your taste buds will surely love and enjoy. The area has ceiling fans and a sound system fit for occasions and special activities along with dining. Day and night friends gather in the bar to talk about the day's dives, critter sightings and camera techniques. The bar has ceiling fans and is fully air conditioned. 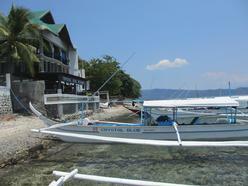 It offers alcoholic beverages and non-alcoholic drinks as well as great-tasting snacks and side dishes. This is the place to be if you're looking for fun, snacks and drinks while you're at the resort. The cantina is open from 4:30 p.m. until 10:00 p.m. Crystal Blue's dive locker is second to none. The pebble stone dive deck over looks the clear blue waters where the nearby islands can be seen or our stunning sunsets can be viewed. The dive deck is covered to protect you and your gear from the intense tropical sunshine. The deck is organized by a hanging rack system to ensure that your gear is dry before you fly and can accommodate large groups in an organized fashion. Large rinse tanks for dive gear, showers, and separate camera rinse tanks all help to move things along quickly and efficiently. Valet style diving has never been easier. Crystal Blue's crew will carry your gear from the office to the dive deck. Once your gear is set our crew will handle the rest. Loading and unloading the boats, tanks, cameras and anything else needed to make the dives complete. The compressor room turns out Nitrox or regular air and always has tanks at the ready. 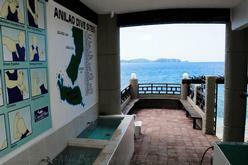 A map of the dive sites helps to familiarize our guests with respect to location, destination and dive sites. Their guides are hand picked and trained to provide the best in assistance while maintaining a healthy green fin approach. There is a special sign language for critters that divers learn at Crystal Blue. 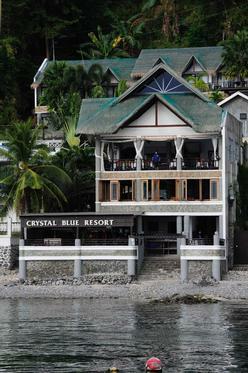 Crystal Blue Resort as seen from the water.